The Bread and Roses exhibit began as an exploratory exercise for my Women’s Studies 1110 class, way back in the winter of 2013. At that time, I just wanted to combat the too-prevalent idea that history is “one story,” a story that can be wrapped up in a neat little package, and filed away until exam time. I wanted student to wander through a street scene, and be able to learn the different perspectives that played a role in the Lawrence, Massachusetts textile strike of 1912. I also wanted to immerse my students in the historical period, so I gave them avatars in period clothing, and I tied their success in completing the exercise to their performance at “the mill,” where they simulated working on noisy and dangerous machines. It worked out to be a very immersive space where students could practice exploratory learning. The first class really liked the exercise, and so I kept building on it, until it got quite large. This spring I applied for a Linden Endowment for the Arts grant, so I could have the space to add in other issues that were current at the time–the growing temperance and suffrage movements, domestic violence issues, and troubling racial undercurrents. It’s proved to be a pretty overwhelming task, but it is now open to the public, and I really hope you’ll go see it, and let me know what you think. 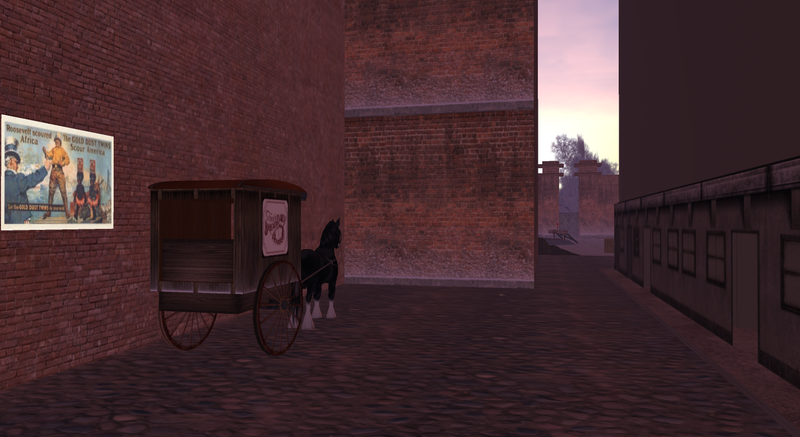 The exhibit is set up for people who are new to Second Life. It begins with a long dark hallway with instructions on how to use the program. You’ll probably want to skip through that, but there’s also a mailbox that gives a notecard list of questions for students. You don’t need this to appreciate the exhibit, but some people might find it useful. The best way to see the exhibit is to click on everything you see, particularly images, to gain an insight into the thinking of the people of that time period. The exhibit itself will change and grow over the coming months, as student projects are underway that will eventually be included. Next Next post: An alternative to VW teaching?